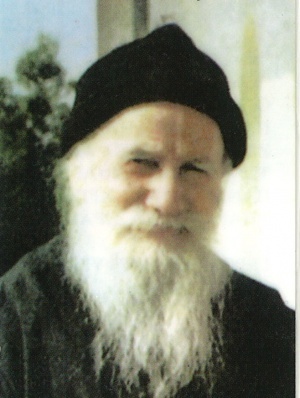 St Porphyrios (Bairaktaris) the Kapsokalyvite (1906-1991) was an Athonite hieromonk known for his gifts of spiritual discernment. He was officially recognized as a saint by the Ecumenical Patriarchate of Constantinople in 2013. His feast day is December 2. He was born February 7 in the little village of St. John Karystia, in the province of Evoia. His parents, Leonidas and Eleni Bairaktaris (daughter of Antonios Lambrou), christened him Evangelos. He was fourth out of five siblings. Only his youngest sister is still alive and is a nun. His family was quite poor and so Evangelos left school at an early age to assist his family to make more money. At some stage, he found a job working at a grocer store in Chalkidiki and also in Piraeus. He was taught to pray the Paraklesis by his father and all other religious matters. Later tonsured with his monastic name of Nikitas. He became a monk at the age or fourteen of fifteen. He served in the skete of Kafsokalyvia, in the Cell of St. George, under two spiritual fathers: Fr. Panteimon and Fr. Ionnakios. Forced by pleurisy to depart the Holy Mountain, he returned to his birthplace, where he was unexpectedly elevated to the priesthood at the age of 21 by Porphyrios III, Archbishop of Mount Sinai and Raithu. With the outbreak of World War II he became a hospital chaplain in Athens, in which post he continued for three decades (1940-1970). His later years were devoted to the construction of the Holy Convent of the Transfiguration of the Savior. After 1984 he returned to Mount Athos, occupying the same cell which he had earlier in life been forced to abandon. Through his role as spiritual father, Elder Porphyrios became known to an ever-wider circle of Orthodox followers. Several compilations of stories and sayings attributed to him have been published. On 27 November 2013 the Holy Synod of the Constantinopolitan Orthodox Church formally glorified Elder Porphyrius as a saint, establishing 2 December as his feast day. St. Nektarios of Aegina, Elder Prophyrios's father was the village cantor and St. Nektarios used his services whilst he was in that area. Constantine Yannitsiotis. With Elder Porphyrios: A Spiritual Child Remembers. The Holy Convent of the Transfiguration of the Savior:Athens, 2001. ↑ Announcement by the Holy and Sacred Synod. The Ecumenical Patriarchate of Constantinople. Wednesday, November 27, 2013. ↑ Canonization of Two New Saints by the Ecumenical Patriarchate. Ecumenical Patriarchate - Orthodox Metropolitanate of Hong Kong and South East Asia (OMHKSEA). November 27, 2013. This page was last edited on March 13, 2016, at 07:39. This page has been accessed 32,727 times.